ბაბი ბადალოვის პრეზენტაცია - შეხვედრის დასაწყისში ხელოვანმა ისაუბრა მისი ლინგვისტური სირთულეების პირად გამოცდილებაზე, რაც ბაბის სახელოვნებო კვლევისა და გამოხატვის საგანი გახდა. ასევე, წარმოდგენილი იქნა "თბილისის დღიური", რომელიც შესრულებულია მისი ვიზუალური პოეზიის კოლაჟის სტილში, გეოეარის რეზიდენციაში ყოფნის დროს. Artist talk of GeoAIR resident Babi Badalov - in the beginning, Babi talked about his personal experience of linguistic confusion, which has become the topic of his artistic exploration and expression. 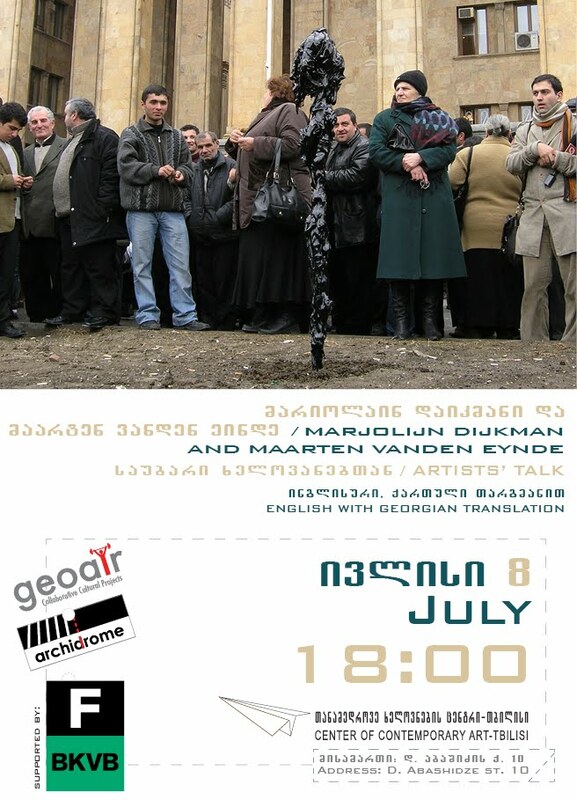 The "Tbilisi diary" created in his visual poetry collage-style, made during his residency at GeoAIR was also exhibited. ბაბი ბადალოვი (1959, ლერიკი, აზერბაიჯანი) არის ხელოვანი და პოეტი, რომელიც ცხოვრობს პარიზში. მისი ნამუშევრების მრავალი გამოფენიდან აღსანიშნავია, თესალონიკის პირველი ბიენალე და Manifesta 8. ბაბის ნამუშევრები წარმოდგენილია კერძო კოლექციებსა და მუზეუმებში, როგორებიცაა: რუსეთის მუზეუმი სანკტ-პეტერბურგში; ემდენის ხელოვნების მუზეუმი, გერმანია; M HKA - თანამედროვე ხელოვნების მუზეუმი ანტვერპში. როგორც ვიზუალური ხელოვანი, ის გამოხატავს საკუთარ იდეებს საგნების, ნახატების, ინსტალაციებისა და პერფორმანსების საშუალებით. ბაბი, ასევე, ახდენს სიტყვებით ექპერიმენტაციას და ქმნის ბუნდოვან პოეზიას, სადაც ურევს სხვადასხვა კულტურების ენებსა და სურათებს. მისი ნამუშევრები ხშირად ეძღვნება ლინგვისტურ ძიებას, რითიც იკვლევს ენის შეზღუდვებს და იმ საზღვრებს, რომელსაც ენა ქმნის მისი მომხმარებლებისათვის და ასევე, უკავშირდება მოგზაურობისას მის პირად ლინგვისტური უხერხულობების გამოცდილებას. უცხო ქვეყნებში, ჩვენ ხშირად ვხედავთ სიტყვებს, რომლებიც ჩვენი ანბანის მსგავსით არის დაწერილი, თუმცა, აქვთ განსხვავებული მნიშვნელობა, ჟღერადობა და წარმოთქმა. ბაბის ვიზუალური პოეზია ხშირად დღიურის სახისაა, რომელიც იქმნება ყოველ დღე მანიპულირებული სასურათო მასალის მისი პირადი ლინგვისტური კვლევის შედეგად და ხშირად, პოლიტიკური შინაარსისაა. ხელოვანის (ან მოგზაურის, მიგრანტის, დევნილის) მოხეტიალე ცხოვრება უქმნის მას არა მხოლოდ კულტურული ინტეგრაციის რთულ საადაპტაციო პერიოდს, არამედ, შეუძლია ის ძირითადად, ენის პატიმრადაც აქციოს. ბაბის პროექტები ამგვარ ლინგვისტურ შეხედულებებს ეხმიანება, რათა ხაზი გაუსვას უფრო დიდ გეო-პოლიტიკურ შეკითხვებს. Babi Badalov (1959, Lerik, Azerbaijan), is an artist and poet living in Paris. He has exhibited in Manifesta 8, 1 st Thessaloniki biennale, amongst many others. His works have been collected in museums and private collections such as the Russian Museum, St Petersburg, Museum of Art, Emden, Germany, M HKA - Museum of Modern Art in Antwerp. As a visual artist, he expresses his ideas through art objects, paintings, installations and live performances. 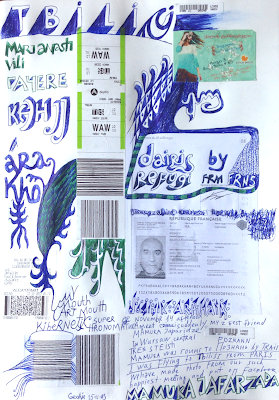 He also experiments with words and writes obscure poetry, mixing languages and images of different cultures. 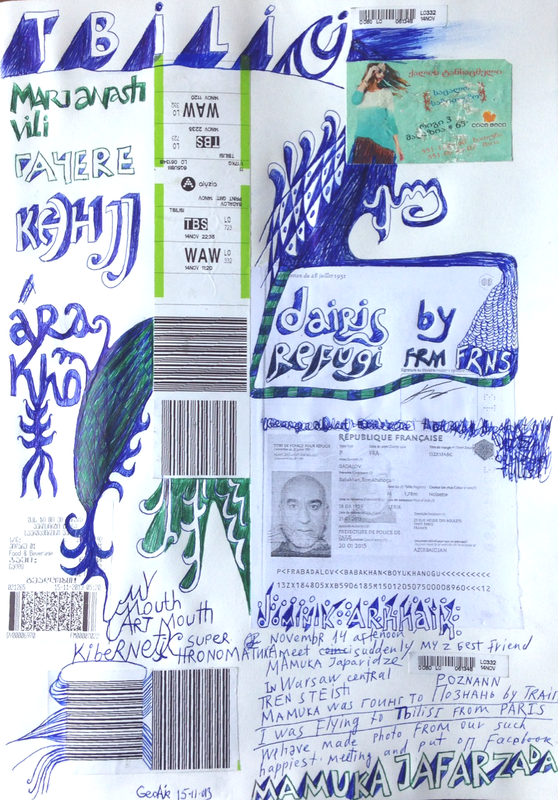 Babi Badalov’s work often is dedicated to linguistic explorations researching the limits of language and the borders it imposes upon its users and based on his personal experience of linguistic inconveniences while travelling. In foreign countries, we often come across words written in the same alphabet as ours, but with different meaning, sound or pronunciation. His visual poetry often takes the form of a diary, created every day through a combination of his own linguistic research of manipulated pictorial material, mainly with political content. The nomad life of an artist (or traveler, migrant, refugee) does not only cause him or her a struggling adaptation period of cultural integration, but can primarily turn him or her into a prisoner of language.